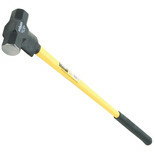 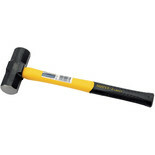 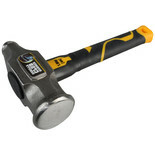 1.8kg sledge hammer forged from fine grain carbon steel with polished head. 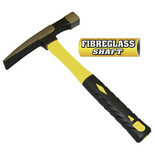 Fibreglass shaft fitted with comfortable shock-absorbing rubber grip. 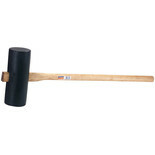 The post rammer is used for driving posts deep into the ground. 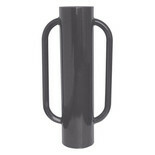 The downward thrust along with the weight of the products makes erecting fence posts easier. 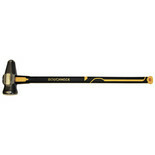 The Roughneck Gorilla Sledge Hammer 6lb features a unique shaped head with dome-shaped striking point to exert concentrated force. 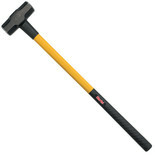 Precision forged from high carbon steel. 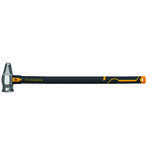 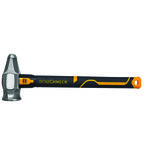 The Roughneck 12lb Gorilla Sledge Hammer has an extremely secure handle fixing mechanism, extra strong fibreglass shock absorbing handle with soft grip and a hole for use with lanyard, etc. 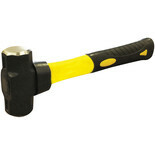 Unique shape head with dome-shaped striking point to exert concentrated force, constructed with a precision forged from high carbon steel. 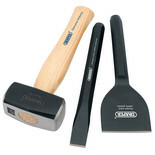 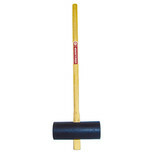 The Draper 6kg Rubber Paviors Mallet has a Rubber head and hardwood shaft, it is ideal for installing paving or curbs.